Our range of products include amino acid based yield enhancer. AMINO ACID BASED YIELD ENHANCER FOR SOIL APPLICATION / FERTIGATION. ample-g is an Innovative Bio nutrition product based on Hydrolyzed proteins of vegetable origin, enzymes & traces of elements derived from the extract of organic origin sources. Useful for enhancing yield & quality of the produce like paddy, cotton, sugarcane, wheat, vegetables, fruit crops & floriculture etc. Hydrolyzed Proteins (Amino acids), Hydrolyzed Carbohydrates, Enzymes and Minerals in Traces : 30% Conc. @ 10% incorporated with Bentonite Granules. Enhances yield & quality of the crop. Increased tolerance of crops to biotic and climatic stresses. Biodegradable environmental friendly and safe product. Can be mixed with conventional fertilizers and pesticides in soil application. ample-g provides better plant nutrition in vegetative & reproductive phase of the crop through availability of amino acids, enzymes & minerals in traces derived from organic sources. Application of Ample- g helps the crop to build resistance against pests & diseases. Enhances metabolic activities in the plant helping in better germination of seed, profuse root system & better vegetative growth. It helps in better retention of flowers, better quality fruits with enhanced flavor. It helps to increase the yield of the crop. Soil Application / Fertigation :-Broadcast 8 Kg to 25 Kg per acre cropwise and can be used as basal dose. 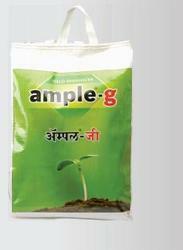 Compatibility :-ample-g can be mixed with chemical or organic fertilizers for uniform distribution in the field.